Thank you for sharing the excitement about my tuxedo pants. I’ve worn them four times already — today included! I never realized what a difference black pants would make in expanding my wardrobe. I’ve made minimal progress on my matching jacket le smoking. I mitered the sleeve hems but didn’t have black satin buttons to finish. I found them online for a great price, but balked at the $12 shipping. My Ducheese satin was too thick for the covered button kits. I was talking to Trena last night about trying to dye some grey satin buttons I had on hand. Out of the blue it occured to me I could sharpie them. Voila! I’m going to DC tomorrow for a long bike ride with Trena. Netherlands bike trip is in six weeks! We’re going to also hit G street where I hope to find purple Bemberg to match my tuxedo pants. At this point, I may buy a bolt. I hate not having lining. Black Sharpies are my best friends. Never got to tell you I love your tuxedo pants. Nice work, R! OMG! Great minds think alike! I am going to sharpie the seam allowance on my faux fur skirt!!! Awesome! I would never have thought to use a sharpie. Does it fade/bleed in the washer? Great idea! I missed your post on the tuxedo pants, but they rock! Can’t wait to see the matching jacket! I have used different colored sharpies on seam allowances and shoe scuffs. How do you use the sharpie on seam allowances? I can’t imagine and am so curious! Brilliant solution! Those tuxedo pants make you look like you wear a size 2. You do, don’t you? Don’t forget to heat set the buttons. A blowdrier is fine for the job, as is putting the buttons in the oven on low. When I was a younger and lived in DC, I took an interesting bike ride a couple of times, starting at Thompson’s Boat House, across from the Watergate/Kennedy Center, biking 20 miles to Mt. Vernon – part on a path, part on roads. Picnic. Return. Google gave me these sites. I’ll be visiting the DC area next week, staying again on Rockville Pike at the Hilton – a hop, skip and jump from G Street. Isn’t the Sharpie a great tool!!! I once got some kind of white stain (I think it was a splash of bleach) on my favorite black knit tee and instead of tossing it, I used the Sharpie!!! Great save on your buttons!! Great idea! I’ve done something similar when after splashing bleach on black clothing. You might want to look for a sharpie laundry pen at the fabric store (or the stationery store)–the ink in the rub-a-dub laundry pens aren’t supposed to wash out. You are totally amazing with the things you do! 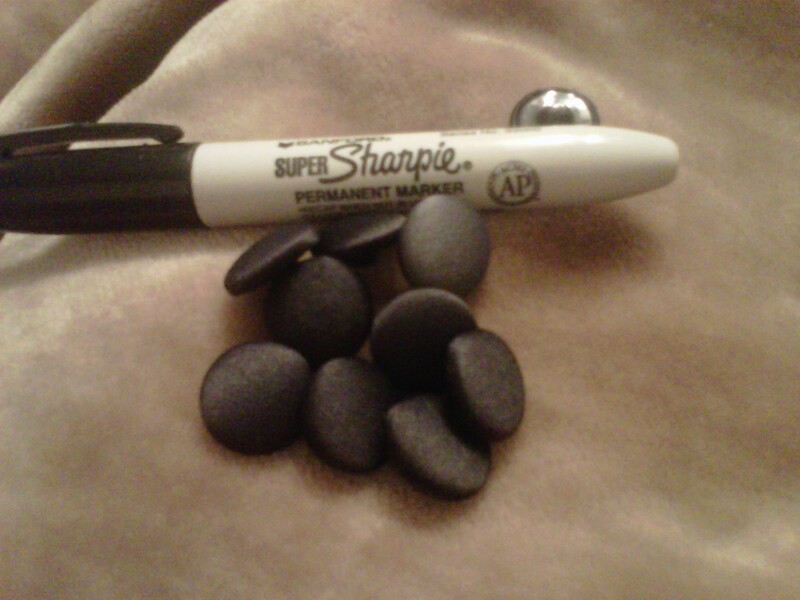 I would have NEVER guessed to use a Sharpie…and have the buttons look SO GOOD! You are just now learning the value of black pants? When I had to dress for the office I had about 8 pair….different fabrics, different weight etc. and probably wore them 2-3 days a week. Welcome to the club, now watch out, you too will find that you need multiple pairs of black pants. Sharpies are the best tool in the sewing room – I bought a set of 12 different colors and have found a number of uses in the sewing room. If you find a faded line where pants or a skirt were hemmed and you now need to lengthen the garment – sharpie to the rescue, the zipper is a close color (like navy, but the garment is midnight navy) – sharpie to the rescue. I made a tote bag where I wanted a line of piping inside the bag in the lining – thought it would look great, but too fussy for a tote – again sharpie to the rescue. Looking forward to seeing the tuxedo jacket. In the 30’s my mother, who hated sewing, had to hem a skirt for home ec class and didn’t have black hem tape–only white. Out came the bottle of black ink. She never sewed again but was a great support to me and pinned up hundreds of hems for my projects over 25 years. I used a sharpie on a Harris tweed tote bag that I made, thinking I had black leather buttons in my stash-turns out they were brown leather buttons! They looked “okay” but a brisk rubdown with black sharpie and they looked PERFECT. Every fall when I dig out that bag I freshen up the buttons! Wow What a great idea! Staining never occurred to me and a few buttons! I will buy a selection on sharpies next time I see them. Genius! (And remember to heat set them). The slapdash sewist is stressing me out on her behalf. What’s this smo-queengue thing when you only have a couple weekends left to sew biking clothes?!? You’re not going to meet the Queen, you’re going to sweat! Make something quick, I beg you :-)..